These include variable volume flow control systems, heating burners, heat recovery systems and filter monitoring, for instance. 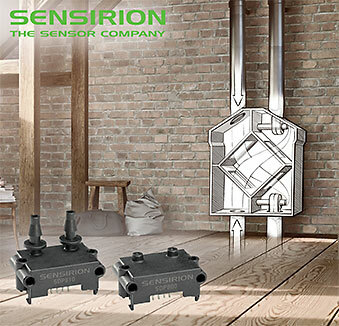 With its new differential pressure sensors, SENSIRION offers housing compatibility with previous generations. The manufacturer has integrated a new sensor chip in the housing of the proven SDP600 series. For the types with analogue, ratiometric power supplies, you can choose between a linear and a square root characteristic output curve via a separate pin. The digital version is extremely versatile and offers adaptable measurement speeds of up to 2 kHz, different measuring methods (impulse mode/continuous mode) as well as an intelligent averaging function. Furthermore, the sensors can be transposed into a sleep mode via I²C command. In these, the power consumption is less than 1 µA. This is ideal for battery-powered applications. Like all sensors from SENSIRION, the SDP800 family is also fully calibrated and temperature-compensated, as well as free from any zero point drift. While the components of the SDP800 series can sealed with O-rings and screwed directly onto a manifold, the SDP810 series is designed for hose connections. The sensors are available ex-stock from GLYN with immediate effect. A fast start with the evaluation kit. To let you discover the possibilities of the digital SENSIRION SDP800, we now offer the EK-P5 evaluation kit. 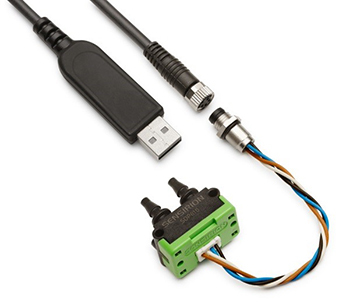 It consists of an SDP810-500Pa sensor, which is connected directly to your PC with a USB adapter cable. Using the software, which is available for free download, you can test the sensor directly under operating conditions. We will gladly answer any other questions you may have. For more information please contact your local GLYN sales office.